Aurora Australis: Composite satellite image of the Aurora Australis (southern lights) from space. 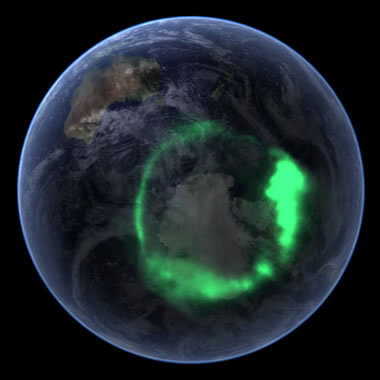 The image was compiled by superimposing data of the Aurora Australis collected by NASA IMAGE satellite atop of an image of Earth from a south polar perspective from the Blue Marble project. The result simulates what the Aurora Australis would look like from a satellite orbiting above. Image by NASA. What is the Aurora Australis? The Aurora Australis, also known as the “Southern Lights,” is a natural light display that occurs in Earth’s atmosphere above Antarctica and the south polar region. It is a fluorescent green ring of light above the Earth that becomes visible during some interactions between the solar wind and Earth’s magnetic field. Auroras are produced when electrons travelling from the Sun collide with gas molecules in the upper parts of Earth’s atmosphere. As the electrons approach the Earth, they descend towards the ground following the attraction of Earth’s magnetic field. As they pass through the atmosphere, they collide with oxygen and nitrogen molecules, dislodging electrons in those molecules and exciting them up to higher energy levels. When those dislodged electrons fall back to their ground state orbitals, they emit a small amount of energy in the form of light. This release of light is known as fluorescence and is very similar to the light released by fluorescent minerals. Earth's Magnetic Field: Paths of particles emitted from the Sun and interacting with Earth’s magnetic field to result in the beautiful auroral displays. Image by NASA. The composite satellite image at the top of this page is one of the most famous depictions of the Aurora Australis and one of the most instructive. It was made by superimposing an image of the Aurora Australis created using data from NASA’s IMAGE satellite, over a composite image of Earth from NASA’s Blue Marble Collection. It clearly shows the geography of the Aurora Australis as plasma from a solar storm interacted with Earth’s magnetic field on September 11, 2005. It was published as NASA’s “Image of the Day” on January 25, 2006. 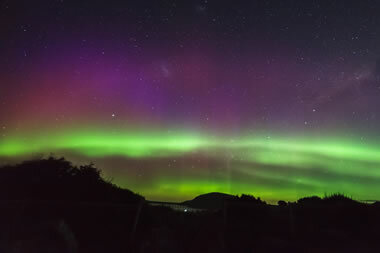 Southern Lights: A photograph of the Aurora Australis from Earth taken at South Arm, Tasmania. Image copyright iStockphoto / igcreativeimage. To observers on the ground, the Aurora Australis looks like a curtain of shimmering light across the night sky. If you are observing the southern lights from a distance, they can look like a fluorescent glow across the horizon. If you are observing them from below, they often look like curtains of light descending towards the ground. The curtains move slowly as the solar wind’s impact area changes over time. 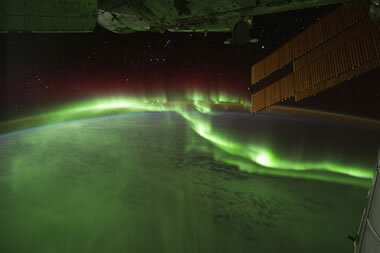 Southern Lights from Space: View of the southern lights from the International Space Station, showing their low position in Earth's atmosphere. NASA launched the IMAGE (Imager for Magnetopause-to-Aurora Global Expansion) satellite on March 25, 2000 with a planned mission of two years. The satellite functioned properly, collecting data for nearly five years. 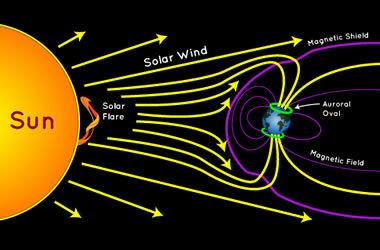 Instruments onboard the satellite acquired a comprehensive collection of images of plasma in the Earth’s magnetosphere. Many of these were imaged in wavelengths not visible to the human eye. These images provided new knowledge about interactions between the solar wind and the magnetosphere, and the magnetosphere’s response during magnetic storms. All of this data was transmitted back to NASA. The Aurora Australis image shown on this page was a very small part, and actually a novelty product, of the satellite’s data collection. Unfortunately, on December 18, 2005, the satellite began missing its expected communications with NASA. NASA made many attempts to regain contact with the satellite and sent signals to reset the satellite’s operating systems. NASA declared the satellite “lost” a few weeks later. In March 2015, NASA launched the MMS (Magnetospheric Multiscale Mission) satellite to expand on the work done by IMAGE. Then, over twelve years after NASA’s contact loss with IMAGE, Scott Tilley, an ameteur satellite tracker, realized that he was detecting signals from the satellite and notified NASA of his discovery. Tilley and fellow amateur satellite tracker, Cees Bassa, had records of signals from IMAGE received in May 2017 and October 2016. NASA began work to reestablish two-way communication with the satellite. Some sporadic contact was established in early 2018, but reliable two-way communication has not yet been achieved.